Richard Bland College encourages individuals to report incidents of sexual misconduct to Campus Police. Timely reporting to the police is an important factor in successful investigation and prosecution of crimes, including sexual violence crimes, and may lead to the arrest of an offender or aid in the investigation of other incidents. An individual who has experienced sexual misconduct has the right to choose whether to file a police report. Filing a police report can result in the investigation of whether sexual violence or related crimes occurred and the prosecution of those crimes against a perpetrator. Reporting the incident to police or College Police does not mean an individual is obligated to testify in court. Reports of sexual misconduct made to Campus Police will automatically be reported to the Title IX Coordinator or a Deputy Title IX Coordinator regardless of whether the individual who experienced the sexual misconduct chooses to pursue criminal charges. 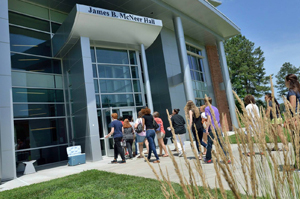 Regardless of whether an incident of sexual misconduct is reported to the police or the College, Richard Bland College strongly encourages individuals who have experienced sexual misconduct to preserve evidence to the greatest extent possible, as this will best maintain all legal options for them in the future. Do not alter, dispose of, or destroy any physical evidence. If there is suspicion that a drink may have been drugged, inform a medical assistance provider and/or law enforcement as soon as possible so they can attempt to collect possible evidence (e.g., from the drink, through urine or blood sample). Preserve evidence of electronic communications by saving them and/or by taking screen shots of text messages, instant messages, social networking pages, or other electronic communications, and by keeping pictures, logs, or copies of documents that relate to the incident and/or perpetrator. Even if survivors choose not to make a complaint regarding sexual misconduct, they should nevertheless consider speaking with University Police or other law enforcement to preserve evidence in the event that they change their mind at a later date. Because some evidence, particularly evidence that may be located on the body, dissipates quickly (within 48-96 hours), individuals who have been sexually assaulted and wish to preserve evidence should go to a hospital or medical facility immediately to seek a medical examination and/or evidence collection. An individual who has been sexually assaulted should not shower, bathe, douche, smoke, brush teeth, eat, drink, or change clothes or bedding before going to the hospital or seeking medical attention. If the individual who has been sexually assaulted decides to change clothes or bedding, they should not wash the clothes worn or bedding used during the assault, and should bring them to a hospital, medical facility or the police in a non-plastic bag (e.g., paper bag).